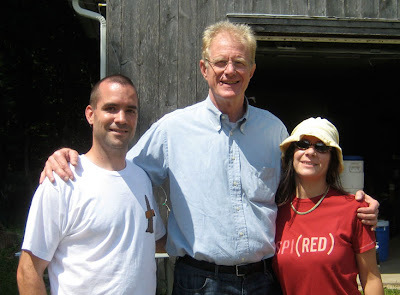 Everyday Greener: Aiki Farms and Ed Begley Jr.
Aiki Farms and Ed Begley Jr.
My wife and I had the pleasure of meeting one of our heroes yesterday, Ed Begley, Jr.
Ed has been friends with Robert Burns (pictured below demonstrating good composting techniques), of Aiki Farms for years. 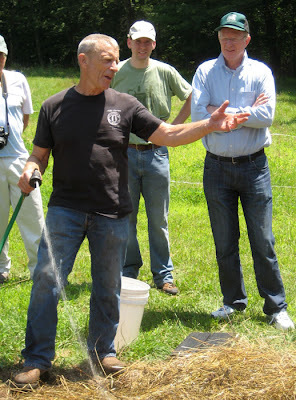 Robert is an organic farmer in Ledyard, CT and had a small event at the farm to teach some of the practices of organic farming and to get people to come out learn about the challenges small farmers face. Begley was the star of the event and most participants had seen his show, Living With Ed. He has been an actor since the '60s and has been an environmental activist since 1970. His show, Living With Ed, is a glance inside the life of he and his tolerant wife, Rachelle. He walks, rides his bike to make toast, she drives a Prius, he cooks in a solar oven, collects rainwater to water the garden, has solar panels, etc. Why is he one of our heroes? Because he lives among peers who care about big houses, lavish lifestyles, ritz, glamour, and fancy cars. And he has been riding his bike around LA for almost 40 years. I respect that. He is a down to Earth guy who was comfortable chatting with us, answering our questions, and eating fresh vegetables from the farm. All in all a very memorable, and inspiring Sunday afternoon, if I do say so myself.